Used in Good Condition, some cosmetic blimishes, paiint scratches. Temperature-compensated accurate CW and FM power measurements from 200 kHz to 2.3 GHz and 2 mW to 10 KW. Uses special 4410-series wide-range elements (elements are sold separately). Wide-range accuracy over a 37 dB dynamic range. Quick Change (QC) connectors to minimize the need for adapters when making critical measurements. Elements are not included, sold separately. The Model 4410A uses the basic principles and look and feel" of the Model 43 but transforms it into a highly accurate high dynamic range instrument. The mirrored-scale linear range meter has 2 switchable ranges, 0-1 and 0-3. 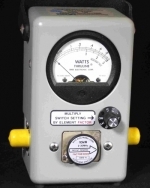 Power is read as a multiple of the value indicated by the pointer, the decimal point location depending upon the range switch position and the factor printed on the plug-in element. Power ranges covered by individual elements are 2 mW to 10 W, 20 mW to 100 W, 200 mW to 1 KW and 2 W to 10 KW, full scale. For most elements, accuracy is +/-5% anywhere above 20% of full scale. The circuitry operates from a standard 9V alkaline battery. Over-Range Protection: To 120%of nominal full scale (I.e. 12 W, 120 W, 1200 W, or 12,000 W). No damage or degradation to the unit will result, regardless of the Range Selector Switch position. Power Range: 2 mW to 10 W, 20 mW to 100 W, 200 mW to 1 kW or 2 W to 10 kW full scale in one single Plug-in Element. Any Bird Series 4410-Element may be used.